As Americans prepare to celebrate Presidents’ Day, they rate John F. Kennedy and Ronald Reagan the best of recent chief executives, according to a new poll conducted by Ipsos in conjunction with the University of Virginia Center for Politics. The Center for Politics and Ipsos collaborated to survey Americans’ views of modern presidents and asked them to rate the dozen presidents who have served since the early 1950s. The strong showings by Kennedy and Reagan reaffirm a previous Reuters-Ipsos/Center for Politics* survey from May 2017 that found them both with similarly high marks. Barack Obama and Bill Clinton, the two most recent Democratic presidents, round out the top four, while the current president, Donald Trump, finds himself near the bottom of the ratings. 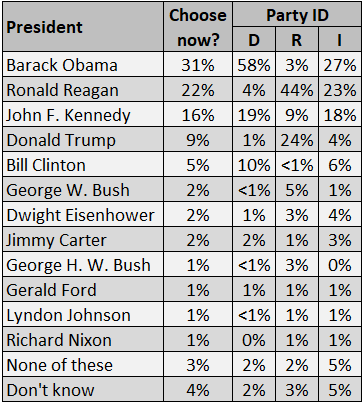 Obama, Reagan, and Kennedy received the most support from respondents when asked which recent president they wish was serving in the White House right now. The online poll sampled 1,004 adults on Feb. 7-8, 2018. The precision of Ipsos online polls is measured using a credibility interval. In this case, the poll had a credibility interval of ±3.5 percentage points for all respondents surveyed. On a scale of 1 to 10, with 1 being terrible and 10 being excellent, Kennedy had the highest average rating, 6.56, of any post-World War II president (going back to Dwight Eisenhower). The father-son Republican presidential pair of George H.W. Bush and George W. Bush received the exact same rating, 5.45. 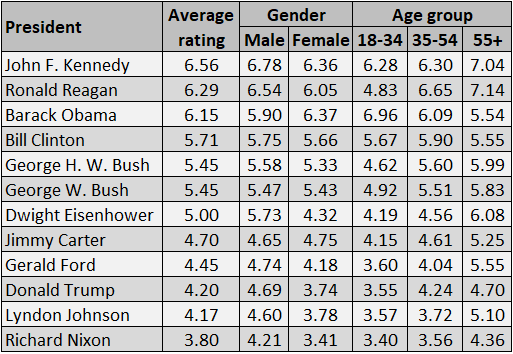 Table 1 shows the average rating for modern presidents by the poll’s respondents. Kennedy took the top spot in these ratings thanks to the strongest bipartisan support of any modern president. Naturally, he had a high rating among Democrats (7.09), but he also received top marks from independents — 6.62, the highest any president earned from that group — and from Republicans (6.20). 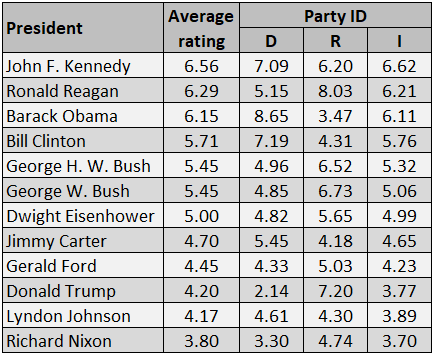 Kennedy’s rating among Republicans was the highest rating the opposite-party identifiers gave to any modern president. The next highest were Ronald Reagan’s (5.15) and George H.W. Bush’s (4.96) rating among Democrats. Independents rated Kennedy highest (6.62), but they also held relatively positive views of Reagan (6.21) and Barack Obama (6.11). Among partisans, Reagan was the highest-rated president among Republicans, with GOP identifiers giving him an average of 8.03. With a 7.20 rating, President Donald Trump earned the second-best score among Republicans, reinforcing the reality that GOP voters have rallied around him. As for Democrats, they gave Obama a rating of 8.65, the highest for any Democratic president and the highest for any single president among a partisan group. Bill Clinton was second behind Obama among Democrats with 7.19, followed by Kennedy at 7.09. Few would dispute that JFK and Reagan have worn well over the decades, more so than any of their modern colleagues, and the data in this survey confirm that. Today’s extraordinarily high level of partisanship mainly explains why the two most polarizing presidents among Democratic and Republican respondents are the two most recent, Obama and Trump. The difference between the average rating among Democrats and Republicans for Obama was 5.18, the largest margin of any president. Trump was next, with a sizable difference of 5.06. Clinton and Reagan tied for a distant third with a partisan difference of 2.88. Reflecting his scandal-driven exit from the White House, Richard Nixon earned the lowest score among all respondents, 3.80, with Democrats, Republicans, and independents all rating him lower than 5.0. Lyndon Johnson, chief prosecutor of an unpopular war in Vietnam, was not far above Nixon with an overall average of 4.17. Fading public memories and generational replacement play some role in the rating of many modern presidents. Americans have fuzzy images of Eisenhower, Gerald Ford, and even George H.W. Bush despite the fact that many scholars view them as fair-to-good presidents. Generally speaking, the oldest respondents (age 55 and up) were less likely to respond “don’t know” when rating the presidents, particularly when rating the less recent presidents. Trump earned the third-lowest overall mark among respondents, 4.20, and his 3.77 average among independents was the second worst, just above Nixon’s 3.70. Compounding Trump’s weak performance among independents was his exceptionally low rating among Democrats, 2.14, the worst mark for any president among any partisan cohort. For comparison, Republicans gave Obama an average rating of 3.47. That Democrats give the lowest ratings to Trump — lower even than Nixon — is remarkable, but so is the high evaluation of Trump among Republicans. This may be further evidence that the Trump brand and the Republican Party are increasingly synonymous, though Trump does not rate as highly among Republicans as Obama does among Democrats. Another notable finding was that women routinely gave lower average scores to 10 of the 12 modern presidents. Only Obama and Jimmy Carter received higher average scores among women than men, although in some instances the differences by gender were very minor (Carter, Clinton, and George W. Bush). Curiously, the president with the largest gender gap in mean rating was Dwight Eisenhower, who received a score of 5.73 among men and 4.32 among women, for a difference of 1.41. Trump had the second-largest gender gap, 0.95. These data, along with data by age group, are presented in Table 2 below. Eisenhower, the earliest president surveyed, received middling ratings from the 18-34 and 35-54 age groups (4.19 and 4.56, respectively), but those who were more likely to remember him (the 55 years or older cohort) gave Eisenhower an average rating of 6.08. Ike’s mark was third best among those 55+ behind Reagan (7.14) and Kennedy (7.04). The eldest age cohort rated Nixon worst of all modern presidents, with an average rating of 4.36. Conversely (and unsurprisingly, given the Democratic lean of younger Americans), 18-34 year olds rated Obama highest, 6.96. As those in their early 30s were in their early 20s when Obama was first elected in 2008, his presidency shaped much of their adult lives. For those in the younger half of the 18-34 cohort, Obama was president for much of their teenage or even some of their childhood years. Perhaps reflecting his aspirational rhetoric and the glamour of what became known as “Camelot,” as well as the fact that an assassin cut short his life, Kennedy ranked second among young people with an average rating of 6.28. The only other president over 5.0 among young people was Clinton (5.67). One thing the youngest and oldest age cohorts could agree on was a disdain for Nixon, who ranked last among 18-34s with an average rating of 3.4. Millennials rated Trump second-worst, with an average rating of 3.55. Among the middle age cohort — 35 to 54 year olds — Reagan was the most well-regarded president, with an average rating of 6.65, followed by Kennedy at 6.30, and Obama at 6.09. The survey also asked respondents which modern president they would choose to serve right now, assuming all were alive and could legally serve. About one-third (31%) of respondents picked Obama, followed by Reagan (22%), Kennedy (16%), and Trump (9%) — with Trump’s votes coming almost entirely from Republicans. Obama’s lead on this question came mostly from strong Democratic support: Nearly three of five Democratic respondents (58%) would want Obama as president, and among Democrats, only Obama, Kennedy (19%), and Clinton (10%) received double-digit support. Republicans, meanwhile, still strongly preferred Reagan (44%) to the current Republican president, Trump (24%). Kennedy showed his usual crossover appeal in this category, finishing third among both Republicans (9%) and Independents (18%). This poll represents the latest collaboration between the University of Virginia Center for Politics and Ipsos, an international, independent marketing research firm. Last year, the Center and Reuters*-Ipsos released polls on Americans’ racial attitudes in the wake of a neo-Nazi march in Charlottesville and on Americans’ attitudes toward recent presidents, which also showed Kennedy and Reagan receiving the highest marks. *Correction: A previous version of this story mistakenly omitted Thomson Reuters as one of the sponsors of the two polls released last year that are mentioned above.